Andrew is the latest member of staff to join the Southdowns sales team after many years in the motor trade. Q How long have you been at Southdowns and what were you doing before joining the company? A I've been with the company for a month and have a background in the car trade, although I also worked for a while in revenue protection on the railways and ore recently sold portable lighting products to retail customers. I really missed the face-to-face selling and so I decided to look for something where I would be in a customer-facing environment again because that's what I enjoy most about my job. Q What does your job involve on a day-to-day basis? 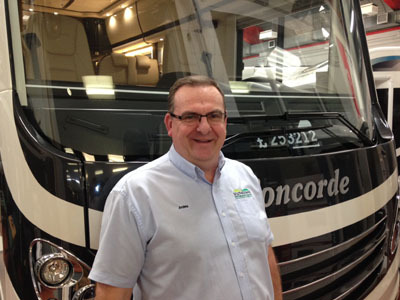 A I meet and greet customers and talk them through the various vehicles, trying to match them to the motorhome that will best suit their needs. I also deal with email enquiries generated via our website and I do lots of phone calls to existing and former customers to see if they are either thinking of selling or upgrading their vehicle and also just to keep in touch. Our customers do value that contact and it can pay dividends in terms of customer loyalty. When they do want to buy or sell, they come to us first. Q What do you think of the company so far? A Southdowns is a very different environment to the car sales jobs I've had in the past. I've worked in some very high pressure roles in both a car supermarket and a range of dealerships where sales are everything. Of course they are important to us too but Southdowns has a very different approach. It can take months for our customers to decide what they want to buy so we build up a strong rapport with them. That relationship is often open-ended and its taking me a while to get used to the idea that I haven't failed if my customer leaves the showroom without buying something. They may come back three or four times or even more so finalising a sale can take months. So far I've found everyone very friendly and helpful and I'm on a big learning curve so it will take a while before I'm up to speed but I really want it to work because I like the whole concept of selling the holiday experience and learning to promote that feeling with people. A I've always fancied buying a touring caravan or a motorhome. We've always done a lot of camping, which over time turned into glamping; bigger tents, a fire pit and plenty of space. I'vy also owned a couple of static caravans in Weymouth and the Isle of Wight so maybe its time to move on to a motorhome. Q What would be your idea of the perfect holiday? A I love the Mediterranean, particularly the area around Mojacar in Almeria, Spain but I also like Charleston in South Carolina and would happily retire to the West Country. I was born and brought up on the South Coast and I cant stand to be away from the sea for too long. Andy lives in Waterlooville with his wife and son. In his spare time he teaches karate and firmly believes that youre never too old to try something new. He was interviewed in May 2016.